Today the Movistar Yamaha MotoGP Team have completed the Jerez MotoGP Official Test, the last riding day of 2018. Continuing their testing schedule, Maverick Viñales and Valentino Rossi spent the allotted time making a final assessment of the new engine specs, setting the 3rd and 11th fastest time of the day respectively. Viñales used today’s session at the Circuito de Jerez – Ángel Nieto to the full, as he was keen to make a final decision on the new engine spec. The Spaniard mainly focused on race pace again, riding a total of 78 laps, mostly with used tyres. As the session progressed, so did his efforts. When he decided to push hard on a flying lap, he set a 1’38.066s. This hot lap earned him third place in the Day 2 results and fourth place in the combined timesheets, 0.121s from first. Rossi also had a productive day at the office, finding a better feeling and pace than he had the day before. The Italian had already shared that he would be taking an in-depth look at the data to make a decision on the engine spec. After a total of 67 laps today, he has come to a clear decision on which direction to work in. His best lap, a 1’38.596s put him in 11th position in both the Day 2 and the combined results, 0.651s from the top. The Movistar Yamaha MotoGP Team have now completed all 2018 riding action. The next test will be held after the winter break, at the Sepang International Circuit, early February. 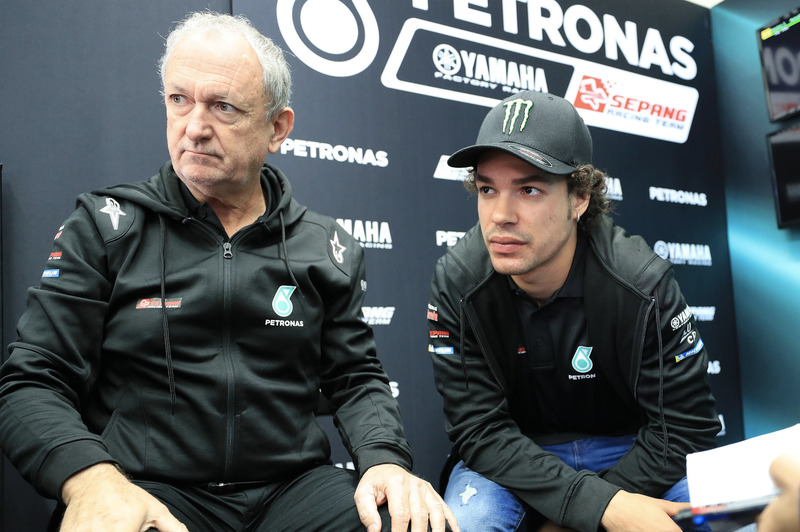 The PETRONAS Yamaha Sepang Racing Team enjoyed a successful final test of the year as they continued their preparations for 2019 with a two-day session at the Jerez Circuit – Angel Nieto. Franco Morbidelli and Fabio Quartararo today took further steps forward in their adaptation to the Yamaha, each showing great potential as they ended the test in 6th and 12th place respectively. The pair spent this morning working on race pace before pushing for a fast lap in the afternoon, enjoying positive results in both aspects. Morbidelli again showed his high level as he rose into the top three positions with an hour remaining, thanks to his lap of 1’38.118. Eventually dropping to 6th position after a total of 68 laps, Franco remained within two tenths of the fastest lap of the day. Quartararo enjoyed his best day so far on the Yamaha since his debut last week. Gaining confidence in acceleration and in corner entry, the French rookie made his first appearance in the top ten with a best effort of 1’38.761 out of his 58 laps, before ending the day in twelfth. Both riders will now enjoy a two-month winter break before MotoGP returns to action with more preseason tests in February 2019, starting at the team’s home track of Sepang. “We can say that I am a happy Team Manager. After just two tests everything is going pretty well for the team and in terms of the lap times we are competing with the fastest guys. To have Franco [Morbidelli] finish sixth and Fabio [Quartararo] twelfth is much more than we could have hoped for. In general, we are very satisfied with the results. There has been no pressure and no problems, and our riders are happy and fast.